500 Rakan Statues of Kitain (喜多院五百羅漢) is one of the most popular spots in Kawagoe. It is one of three major Rakan in Japan. These 500 Rakan Statues were made from 1782 to 1825. There are 538 statues and all of them are identical. Each one of them has different face and facial expression. Admission for special building and garden: 400 yen for Adult, 200 for kids. There is a group discount. Combined with the building of the Temple. Open: 8:50 to 16:30 (3/1 to 11/23), 8:50 to 16:00 (11/24 to end of Feb) Holiday open 20 min. longer. 500 Rakan Statues of Kitain is one of 3 major Rakan in Japan. 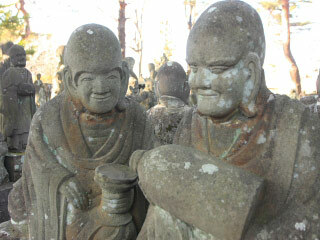 Rakan Statues were made from 1782 to 1825 by the wish of Kawagoe Kitadajima. There are 533 Rakan Statues, and Amidanyorai, Jizobosatsu and other bosatu statue. Total 538 statues are placed in Kitain. Rakan is short name of Arakan. It's a name for holly and respectable person.